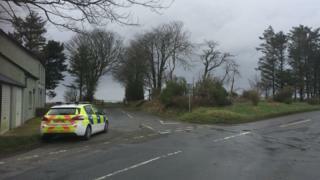 A man who went on the run after a police officer was assaulted in Ceredigion has been arrested in Sussex. The Dyfed-Powys police officer was attacked by two men as he carried out a "routine stop" on the car at Synod Inn on 9 February. The force said it had been searching for the man since Saturday, and a 24-year-old was arrested on Friday. A 29-year-old man has been charged with several offences, including assault causing actual bodily harm. He has appeared in court, also charged with criminal damage, aggravated vehicle taking, vehicle damage and two counts of taking a vehicle without the owner's consent. The officer is making "steady progress" after the incident, but has not yet returned to work. Ch Supt Peter Roderick said: "I am pleased to confirm the arrest of the outstanding man, following a long and intense operation to locate him. "This operation has involved departments across Dyfed-Powys Police, as well as colleagues from other police forces as we focussed on locations outside our force area."